Sometimes it seems we want the winter to come just so that we can prepare hot and tasty soups. 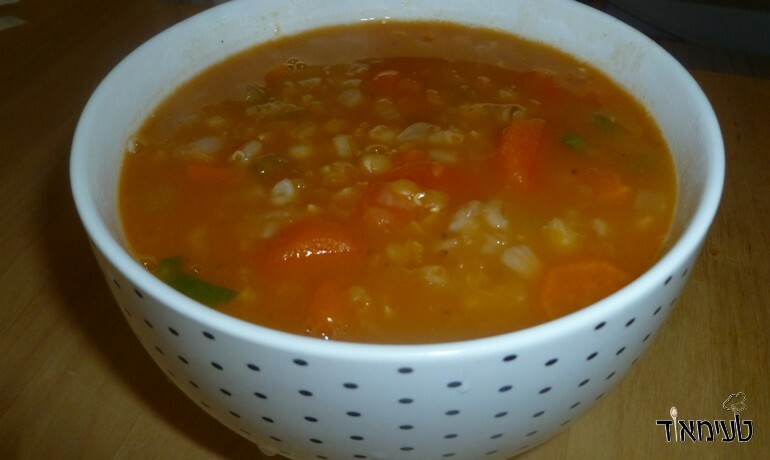 There is no soup that is more fitting for the winter than a nice thick Barley Soup. The joy is doubled when we take the initiative and add some lentils and vegetables. Like all bean soups - it is recommended to start preparing well in advance, because it requires long cooking. But trust me - it's worth every minute of waiting. Heat canola oil in a large saucepan. Finely chop the celery and add to the onions. Cut the carrots into half circles and add onion and celery. When the carrots begin to soften add 7 cups of water. Cut the sweet potatoes and potatoes into cubes and add to the pot. 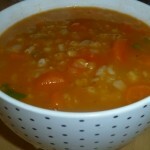 Rinse the barley and lentils well and add to the pot. Add salt, pepper and 3 heaped tablespoons of tomato paste and bring to a boil. Cook over medium heat in a pot partially covered for two or three hours, until the soup thickens and becomes stew. You can shorten the cooking once the vegetables are ready, depending on how thick you want the soup to be. Serve hot on a rainy and cold winter day.